This 7 day trip is for those that want to enjoy hiking on one of Africa’s most beautiful mountains. This is a non technical ascent that takes hikers to Point Lenana and it is fully supported with all our own tents and gear rather than using routes that rely on the huts. Starting at Chogoria this trip is designed to see the best of the mountain. 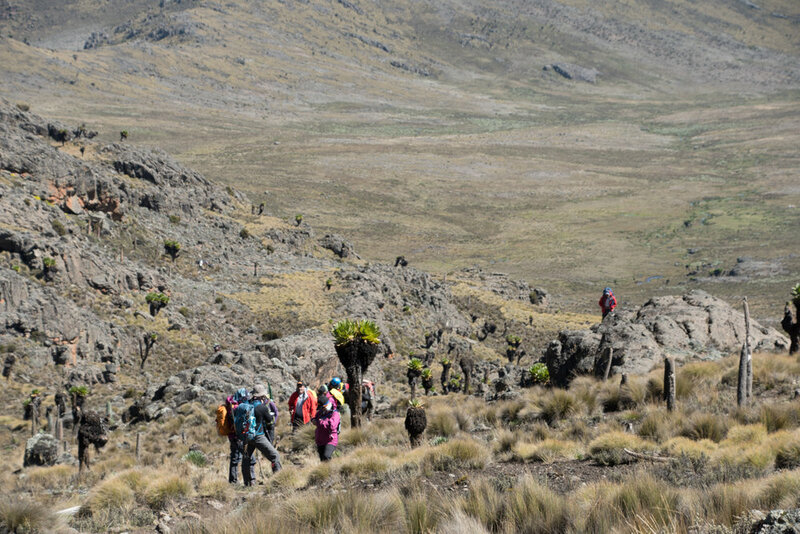 There is an ascent to Point Lenana at 4985m and so participants will ascend into extreme altitude on this trip. The descent is via Sirimon and note pickup from Old Moses can be arranged by 4×4. Upon arrival into Jomo Kenyatta International Airport you are met and transferred to your accommodation in Nairobi. This evening there is a welcome dinner & comprehensive briefing with the Climbs Manager and your guide. Overnight Lodge (Dinner). After breakfast you drive towards the eastern side of Mount Kenya to Chogoria town before proceeding to the park gates of Mt Kenya to start our hike. The 4×4 vehicle drops us off at a point that the vehicle can safely reach (the road is often muddy and further up, unpassable) and we take lunch while our crew finalise the packing. From here it is normally a 4 hours hike to Meru Lodge (2,950 m / 9,680 ft). 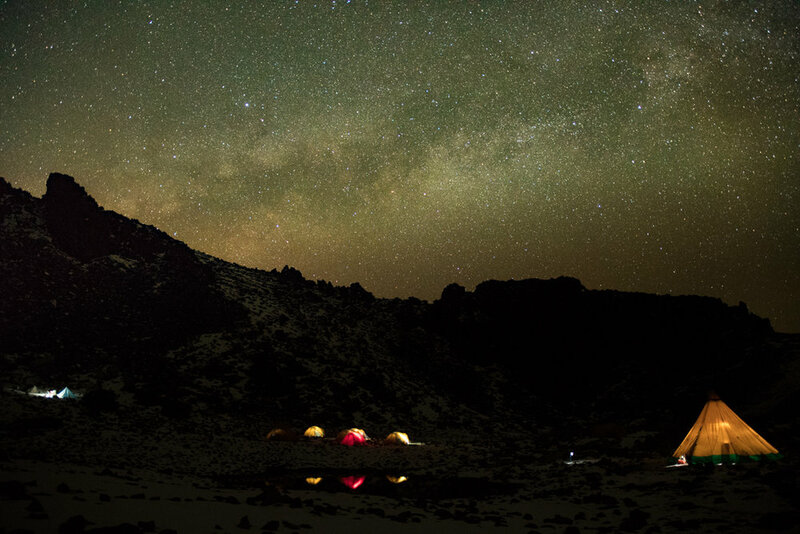 Overnight Meru Mt Kenya Lodge (Breakfast, Lunch, Dinner). We start the hike into tropical forest vegetation occasionally enjoying the sighting of wild game such as buffaloes or elephants amongst a host of many high altitude bird species who reside here. You will have a picnic lunch before continuing to Lake Ellis Camp (3,100 m /10,170ft). Overnight Lake Ellis Camp (Breakfast, Lunch, Dinner). Today you start the hike of the steep slope towards Lake Michaelson and you arrive in time for lunch. Lake Michaelson has arguably the most scenic views on the mountain with Vivien falls and the Nithi gorges. (3,950 m 12,960 ft). Overnight Lake Michaelson Camp (Breakfast, Lunch, Dinner). Depart the camp after breakfast and continue the ascent to Simba Col arriving in time for lunch. 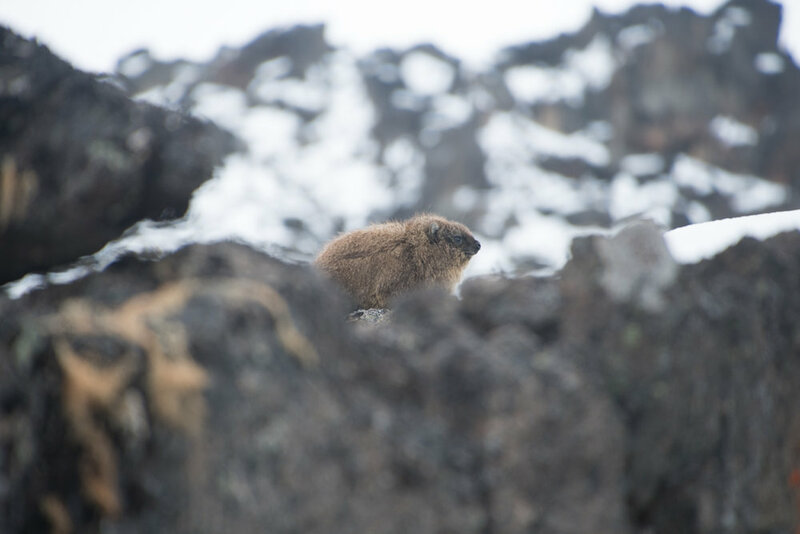 Unique high altitude fauna as the rock hyrax can be seen in this area. After lunch, there is time for acclimatization walks to Tooth peaks and Delamere peak in preparation for the summit ascent later. (4,400 m / 14,435 ft). Overnight Simba Col Camp (Breakfast, Lunch, Dinner). At 330am you are woken up by the camp crew and have some tea and biscuits. Start the attempt of the scree and rock to the summit, Point Lenana (4,985 m / 16,355 ft), which is the highlight of our trip! After taking photos of the African sunrise and on a clear day views of Kilimanjaro, you descend slowly down to Shipton’s Camp for lunch. In the afternoon you rest before dinner. (3,200 m /10,500 ft). Overnight Shipton’s Camp (Breakfast, Lunch, Dinner). Depart camp after breakfast and walk down the bamboo forest to Sirimon gate and meet your vehicle. PLEASE NOTE: most of our guests are dropped at Nanyuki and fly onto the Mara or Laikipia or transfer to Samburu. Our vehicle returns to Nairobi and so guests can be dropped on route at any point. Any tranfsers / flights further afield are charged.